It’s no surprise that America’s first planned city is home to number of architectural masterpieces. From neo-Gothic Harkness Tower to modernist Beineke Library, New Haven plays host to an eclectic assortment of architectural styles, as well as a formidable collection of public art. 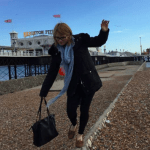 The result is a happy marriage of classic and contemporary, giving an unexpected but well-deserved vibrancy to this historic Northeastern town, best appreciated by embarking on a completely-gratis walking tour. Begin your tour on the New Haven Green, located at the heart of the city’s original nine-square grid. Three churches — Trinity, Center, and United, representing Gothic, Georgian, and Federalist architectural styles, respectively – line New Haven Green’s northeast quadrant. Trinity Church, completed in 1815, was the first Gothic church built in the United States. 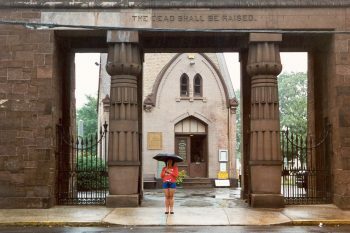 Though today a site of community events, New Haven was reminded of the Green’s cemetery past when two skeletons were found entangled in the roots of the Hurricane Sandy-toppled Lincoln Oak. 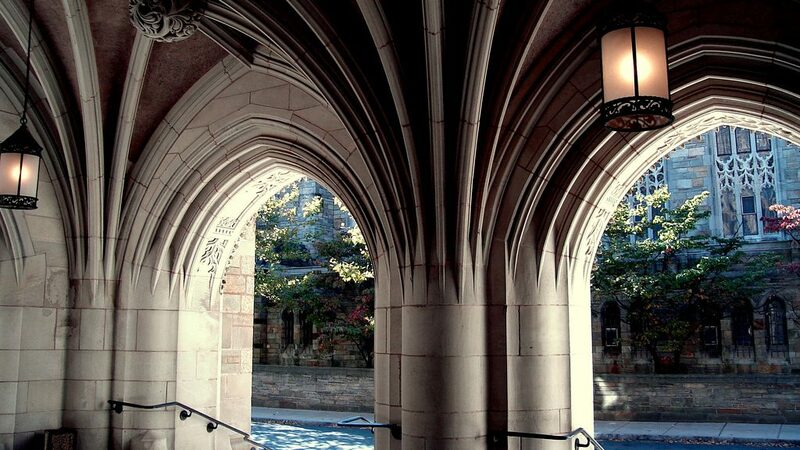 Follow the straight walking trail located beside Center Church to reach Phelps Gate, the entrance to Yale University’s Old Campus, and saunter under Tudor-style gatehouse Phelps Hall to enter the quad. 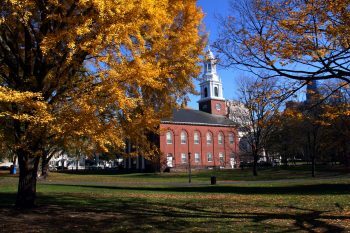 Following a £500 gift from Elihou Yale in 1718, Yale University changed its name from the Collegiate School and moved to the Old Campus site in New Haven. Old Campus is notable for the Victorian Gothic residences lining its perimeter and asymmetrical network of stone paths created to encourage interaction between fellow students and faculty. Note the statue of Nathan Hale standing outside his former dormitory. Since no photographs of the spy himself were available, the memorial was modeled on the likeness of a particularly patriotic-looking Yale student. Walk towards the center of the quad and rub Theodore Dwight Woolsey’s toe (a shiny brass color from repeated touch) before following the path straight ahead to the back exit. Without a Yale ID it’s difficult to access individual colleges, but take time to admire the emblematic Harkness Tower from High Street. 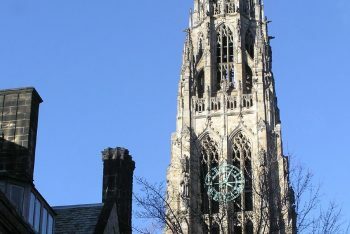 Completed in 1921, English Perpendicular Gothic-style Harkness Tower is 216 feet tall to represent the age of the university at its construction and features three tiers of statues. Bring binoculars and you’ll spot figures ranging in subject from Aristotle, to Eli Whitney, to allegorical representations of War and Peace and Death and Freedom. Twice a day at 12 30pm and 5 30pm, the tower’s 54-bell carillon fills the air with melodies. From High Street, take Library Walk (to the left of Harkness Tower) up to York Street. Make a right and turn left onto the path located next to Toad’s Place. 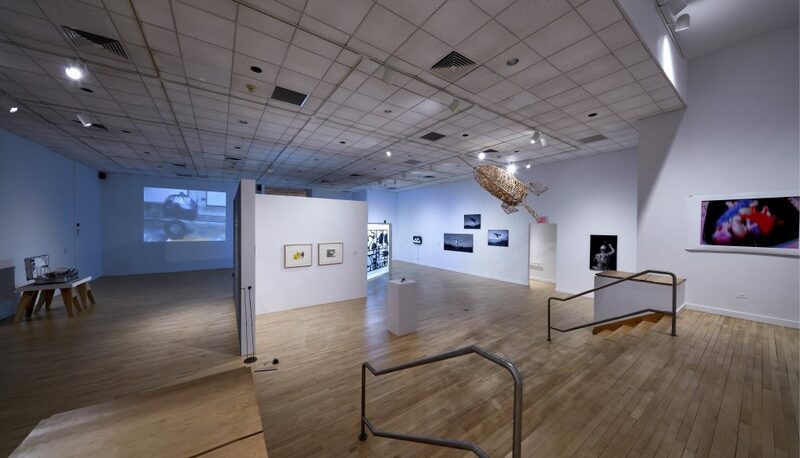 Take time to explore the enclosed space, home to several public artworks. 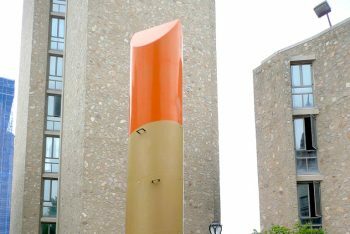 Stroll north towards Morse College to find Lipstick (Ascending) on Caterpillar Tracks, created by Claes Oldenburg in 1969 in the midst of student protests against the Vietnam War. The tube of lipstick perched atop heavy tank machinery playfully juxtaposes absurd/solemn and beauty/violence and remains an enduring piece of political pop art. Head north from Morse College Courtyard towards Tower Parkway. 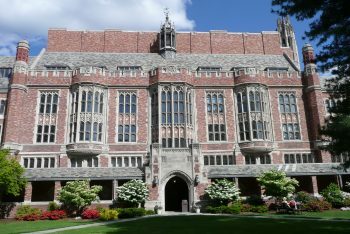 Take the next right onto York Street to pass picturesque Yale Law School, where the university’s most famous couple, Bill and Hillary, met in 1971. Turn left onto Wall Street and swing left again into the unmissable Beinecke Plaza. Beinecke Plaza, more formally known as the Hewitt Quadrangle, is dominated by the Beinecke Rare Book and Manuscript Library. 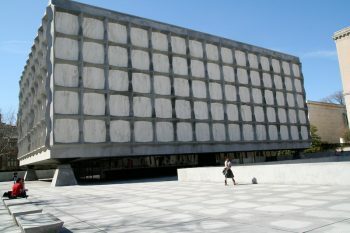 A jewel box ascending from the all-white plaza, the Beinecke Library is covered in translucent marble panels that block books from sunlight in daytime hours and transmit amber interior light in the evenings. The building balances on four narrow pillars at its corners, perhaps in line with the precarious nature of the tomes the Beinecke protects. 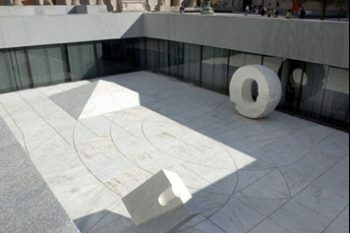 Next to the library, sunken into the lower level, sits the abstract sculpture The Garden (Pyramid, Sun, and Cube) by Isamu Noguchi. Marble-carved figures representing the earth (pyramid), sun (pyramid), and chance (cube) create a spatial continuity in appearance and theme. Walk north past the Beinecke Library and curve to the left, up the stairs, to exit the plaza. Turn right on High Street and right on Grove Street past the entrance to the Grove Street Cemetery. Turn left on Hillhouse Avenue. 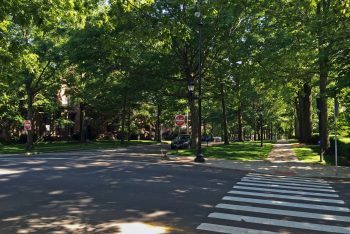 Flanked on either side by nineteenth-century mansions, Hillhouse Avenue was lauded by both Mark Twain and Charles Dickens as the most beautiful street in America (though Dickens apparently bestowed this prize upon many American streets). The lower half of Hillhouse Avenue is not technically included in the Hillhouse Avenue Historic District, but landmarks such as the Warner House (#1 Hillhouse) and St. Mary’s Church (#5 Hillhouse) are well worth a look. Continue up Hillhouse Avenue to the James Dwight Dana House (#24 Hillhouse), designated a National Historic Landmark in 1965. Dwight Dana, a prominent geologist of his era, lived here with his young bride beginning in 1849, and although the home is particularly distinctive, the trisectional structure is pleasing to the eye. Further up the street is the more architecturally notable Mary Prichard House (#37 Hillhouse), a Greek Revival building covered in stuccoed brick and boasting two imposing columns. 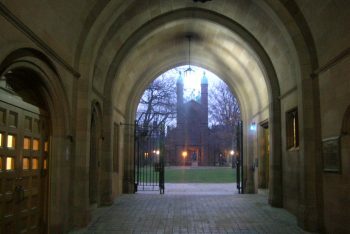 The Victorian Gothic Henry Farnham Home (#43 Hillhouse), distinguished by its red brick façade and all-white corniced door portal, has been home to Yale’s presidents since 1937. In 1968, it served as the backdrop to a protest by Yale’s all-male student body in favor of coeducation. Recently renovated to the tune of $17 million, the square dwelling is topped off by a trapezoidal, stone-grey roof that belays perfect symmetry. Congrats, you made it! The Modern Head sculpture by Roy Lichtenstein at the intersection of Hillhouse Avenue and Sachem Street marks the end of the tour. 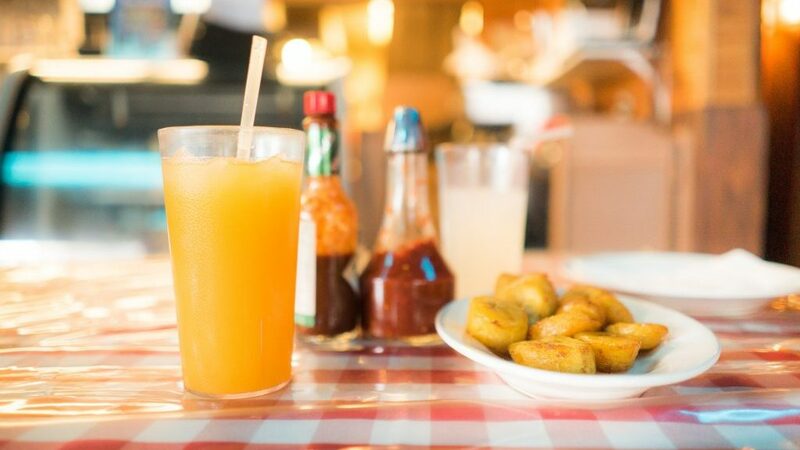 Finish up with a bite to eat at one of New Haven’s superlative restaurants. 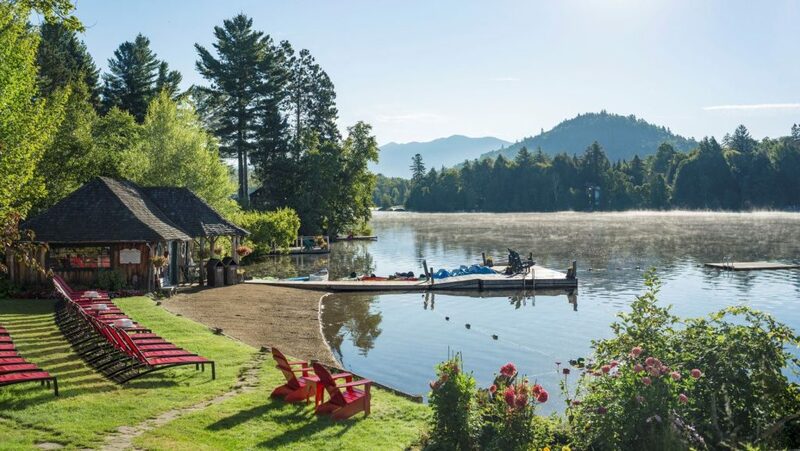 This is an easy and quick day trip from NYC. Take Metro-North to New Haven. The train ride from New York City to New Haven takes approximately 100 minutes. 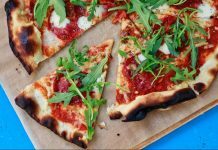 For further help planning your trip to New Haven, visit InfoNewHaven.com.